(please click on the title for full story and photo) Congratulations to SOO-Peterborough! The community council was recognized for their achievements in community leadership by receiving the Scholfield Award of Community Distinction on May 28. Congratulations SOO-Peterborough! (Pictured are Ray Walt and Mary Harran, members of the community council.) 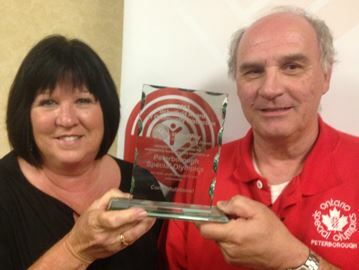 For the news link, please visit http://www.mykawartha.com/news-story/4545165-special-olympics-wins-scholfield-award-of-community-distinction/.